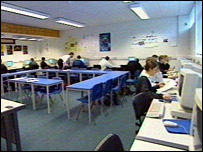 Schools are being asked their views on a special project being introduced for pupils who go on to study at A-level. The idea of an "extended project" was put forward by Sir Mike Tomlinson in his review of 14-19 education. The aim is to give pupils the chance to work at an in-depth level and improve their planning and analytical skills. The Qualifications and Curriculum Authority (QCA) has drawn up a framework and criteria for the project which it hopes to pilot from next year. The QCA hopes the scheme will roll out across all schools in England, Wales and Northern Ireland from September 2008. The extended project was one of the changes outlined for post-16 education in the government's White Paper for 14-19 education. In qualifications terms, it will be the equivalent of an AS-level or half an A-level. "The aim is for students to have the opportunity to carry out a task relevant to their own lines of study and interests," the QCA said in a statement. "The extended project will be a single piece of work requiring a high degree of planning, preparation, research and autonomous working. "Projects will differ by subject but will all require students to persist and explore a subject independently and in depth." It is hoped the project will allow pupils to bring in knowledge from a range of subjects. For example, a student studying French and geography might prepare a project on the impact of tourism on the environment of a given region in France. The QCA consultation period ends in August, with a view to pilot schemes starting in September. In 2004, Sir Mike Tomlinson, the former chief inspector of schools, was commissioned by the Department for Education and Skills to carry out a major review of secondary schooling in England. He recommended that GCSEs, A-levels and vocational qualifications should evolve over the next decade into a new diploma system. But the government did not adopt this proposal. Instead, the then Education Secretary, Ruth Kelly, presented a white paper which required pupils to pass tests in "functional" literacy and numeracy. It also laid plans for specialised diplomas in 14 subject areas, advanced questions in A-level exams, the extended project instead of fourth or fifth AS-level and post-results university applications by 2010.